The Top & Bottom press roll is equipped with FAG roller bearings having No. 23272 k inserted into water tight bearing . The Top & Bottom roll will be dynamically balanced at the 1000 MPM. The roll will be BDL coated & Bearing Housing will be steel cast . Roll is provided with rotory joint for cooling the shell inside . Face Length :- 4400 mm. Shell Thickness :- 18 mm. 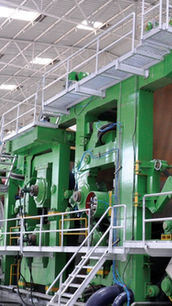 The Press Felt roll shell is made out of prime quality seamless pipe having shell thickness 18 mm and CI GUJJAN . The end journals of EN-8 with CI GUJJAN are press fitted with the shell. The press felt roll is completely assembled, dynamically balanced and precision ally machined/Ground for operating speed of 500 meters/min. The felt roll is equipped with FAG bearings having no. 22318 K inserted into water tight bearing housing of cast iron with C.I. laybrinth. Type :- Pneumatic operated type. Auto Guide will be operated by Pneumatic Cylinder The palm and sensor elements shall be ceramics coated ..
roll is covered with chrome plating having thickness 100 microns. Manufactured out of S.S 304 tube, machined suitably and equipped with single slot equipped with ceramic top . Necessary holder device is provided including connection for vacuum. The Pipe Size shall be 8" N.B. Stretcher made in S.S.304 ,4” dia pipe with bronze gear & worm shaft with C.I Gear box body . The Shower is oscillating shower. The oscillating is done by geared motor and variable speed drive to be provided by the customer. Type of Shower :- Needle Jet. Needle Size :- 1.0 mm. Pipe :- 2" N.B. S.S. -304. The oscillating shower shall be complete with holding brackets and movable roller bracket etc. Type of Shower :- Fish Tail. 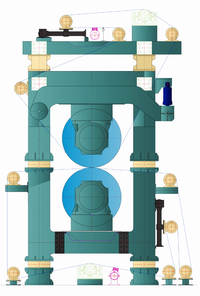 The stationary low pressure shower is fixed with brackets on both the sides and it has provision to adjust it in the angular direction. Made out of fabricated stainless Steel S.S.-304 for collection and discharge of white water from Press Bottom Rolls with necessary supports etc. 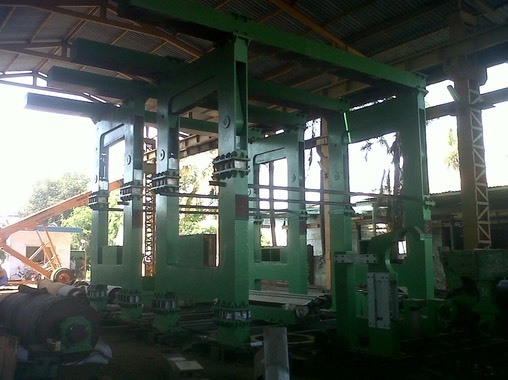 Complete press frame will be fabricated from MS 16,20,25,30 & 50 mm thick plate. Lever will be fabricated from MS 25mm thick plate with G.M .Bush Fitting & S.S Pin . Complete framing fabrication machining & Drilling Tapping as per our design . With 1.8mm stainless steel 304 cladding. Size of Sole Plate:- 400 mm w x 75 mm thick x 1500 mm lg.The Sole plates are made out of cast iron construction and are rectangular in construction and precisionally machined on all the Surfaces and having 4 no .of jack tapping. Plate forms, Walk ways & Ladders are included in our scope ofsupply & same shall be fabricated out of M.S. Angle iron, channel & Flat. The railing shall be fabricated out of 'A' class pipe and shallbe epoxy painted.